The restaurant industry is constantly growing, and this trend is not expected to slow down any time soon. (source) No wonder so many entrepreneurs consider opening their own food place. Running a successful restaurant is definitely possible but it also demands some considerable effort. How can you add more value to your new business? What are the keys to smart restaurant marketing? We provide you with answers to these and other important questions which you should consider before starting your own eatery. Firstly, think about all the different costs which you will have to cover. Do not miss less obvious things such as credit card processing fees or a music license. Secondly, figure out how much your soon-to-be customers will be able to pay for the food which forms your menu. It is crucial to consider these things earnestly – look at how it all actually works in reality, not how you would like it to work. You should prepare more than one variant of your profitability project, consider at least a few kinds of restaurants with different expected sales revenue. According to Forbes (source), the markup on selling pancakes may be as high as 900%. On the other hand, the markup on serving pizzas varies from 580% to 636% (source). Preparing a business plan may seem like an exhausting job, but you should not try to start any business without it. Think about what you want to give the customers and how you could overcome the competition. For instance, McDonald’s is known for its fast service while True Food Kitchen in Chicago (source) focuses on selling healthy dishes. Do you want to learn more about creating the best business plan possible? Read more here Your whole business plan on one piece of paper. Your menu has to meet the expectations of your target group. Moreover, it definitely cannot be too long (find out why here). Take your time to set prices for your dishes at just the right levels: about 1/3 of the price should be the costs of a meal, 1/3 – employee salaries and 1/3 – profit. Do not use too many ingredients because the food gets spoiled quickly. UpMenu system offers a smart tool which monitors sales on a regular basis and generates reports automatically. Thanks to this, you are able to see if specific meals are profitable and also start promoting less popular options. 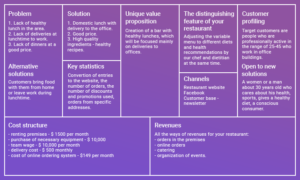 Your business will not be successful without a well-planned restaurant marketing strategy. A Professional online food ordering system, such as UpMenu, may help you with things like organizing newsletter campaigns or creating a loyalty program. 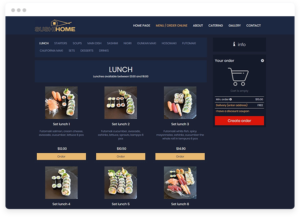 In addition, learn how to gain maximum profit thanks to choosing an online food ordering portal alternative instead of cooperation with the portal – read the article: Seamless alternative for restaurants. 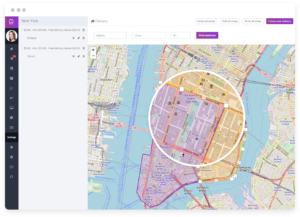 Last but not least – decide which location will be the most beneficial for your restaurant. It has an enormous influence on the success of a business. Find out more in the article Restaurant location – a propeller or a brake in your restaurant marketing strategy? Are you ready to run your one of a kind restaurant business? Go for it! But first, make sure that you have taken care of the important things like a profitability project, business plan, menu, restaurant marketing, and location. Take your time to consider all these questions now so you will not have any unpleasant surprises in the future. Good luck with your new business adventure!